Republican Mike Johanns, Democrat Scott Kleeb and Green Party candidate Steve Larrick debate at State Fair Park. Mike Johanns: I�m the only candidate who�s actually dealt with the budget. Scott Kleeb: Bush & Johanns created current failed policies. Mike Johanns: Growing the economy will balance the budget over time. Scott Kleeb: Return to pay-as-you-go spending. Steven Larrick: Only candidate to oppose drilling in ANWR. Mike Johanns: New corn genetics brings 40% yield increase & more ethanol. Mike Johanns: Opposes Warner-Lieberman Climate Security Act. Scott Kleeb: Always a supporter of ethanol; along with solar & wind. Scott Kleeb: Supports Warner-Lieberman Climate Security Act. Steven Larrick: We need a renewable energy policy. Steven Larrick: Green energy is the future of Nebraska. Scott Kleeb: Johanns wastefully spent $20M studying crawdads in Australia. Mike Johanns: Didn�t phase out adult mental health care services. Mike Johanns: Giving all taxpayers federal coverage would cost $480B. Scott Kleeb: Shouldn�t phase out adult mental health care services. Scott Kleeb: Give all taxpayers access to federal coverage like Congress. Mike Johanns: Alternative community hospitals got 9000 more people treated. Scott Kleeb: Alternative community treatment not adequately funded. Mike Johanns: Negotiating with rogue nations squanders American prestige. Scott Kleeb: We have forgotten how to use diplomacy. Scott Kleeb: Johanns left Secretary of Agriculture job & let down farmers. Mike Johanns: Focus on small towns. Scott Kleeb: Always keep Nebraska�s interest first. Mike Johanns: No tax increase for research on celluosic ethanol. Scott Kleeb: Supports $1B in tax funds for research on celluosic ethanol. Steven Larrick: Invasion of Iraq was based on false premises. 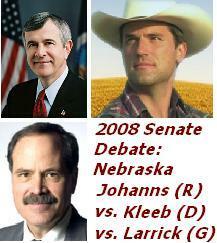 The above quotations are from 2008 Nebraska Senate Debate between Mike Johanns & Scott Kleeb.